Above after the service on April 7 : Front Row l-r – Richard and Ann Wilkinson, Jean Cockburn and Rona Trowell. Back row – Anne Moore, Martin and Pauline Beckett and Frank Trowell. Aysgarth Methodist chapel was full on Sunday April 7 for its final service before its official closure on April 22. The few remaining Methodist chapels in mid and upper Wensleydale were represented as well as St Andrew’s Church, Aysgarth, and the local community. The service was led by Dr Richard Wilkinson who for many years was a local Methodist lay preacher as well as being the organist at St Andrew’s Church. He spoke of his own sadness about the closure of the chapel which, he said, had been a wonderful centre for the village. He reflected on the history of the chapel and the local man to whom it has been a memorial – the Rev Sylvester Whitehead who served for ten years as a missionary in China and who, in 1904 became the President of the Wesleyan Conference. The present chapel was built by local craftsmen in 1900. It replaced a cottage on the site which had been used for services since 1766. Dr Wilkinson remembered those who had ministered there and recalled the annual nativity plays in which the village children participated. “These were a wonderful experience for all of us, led by Jean Cockburn and Rona Trowell,” he said. Mrs Cockburn started the nativity plays in 1966 four years after taking over the chapel’s Sunday School. For 20 years or more she has assisted Rona Trowell with the nativity plays and all age worship services. 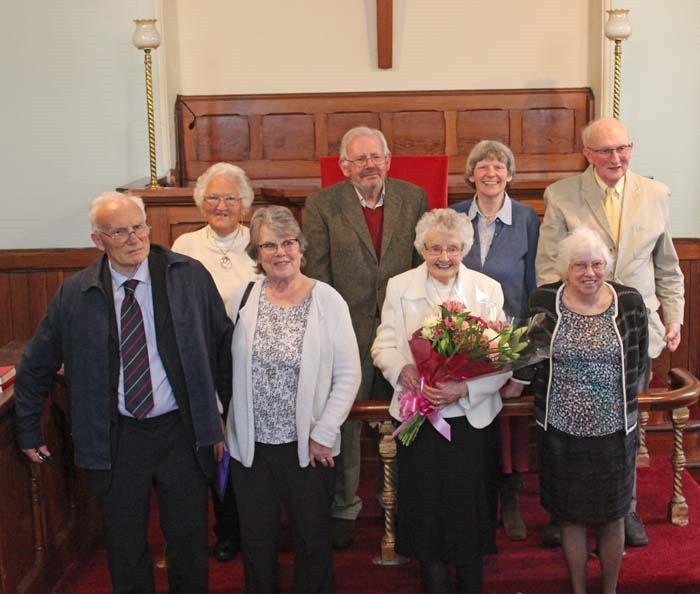 “I ‘m very grateful that I’ve had over 90 years of being a chapel member,” said 92-years-old Mrs Cockburn as she shared some of her memories (see below). She is one of the five remaining members of Aysgarth chapel who made the decision to close it. She sang a solo at the beginning of the service, and there were two duets by Emma Cloughton and Colin Bailey. The organist was Diane Hartley. After the service Mrs Cockburn was presented with a bouquet of flowers by Mary Hugill as a thank you for all she had done at the chapel for so many years. Most of the congregation remained in the chapel afterwards for the buffet tea. When Richard asked me if I would say a few words about our chapel my first thought was “No Way” – but I thought of the years I’d asked him to play [the organ] and he never refused so I had second thoughts and decided I just couldn’t refuse. I seem to have been involved with chapel all my life, sitting with Mam firstly and then in the choir, with Dad [Cecil Riggs] playing the organ. Occasionally Mam allowed me to take my panama hat off and put it on the window ledge, but in the 1930s not wearing a hat would have been frowned on. Everyone wore their Sunday best for Chapel, and trousers for women wouldn’t have been acceptable at all. The heating for the Chapel was a coal boiler which Dad had to go every Sunday morning whatever the weather down the steps into the cellar to light the boiler. Each year members and friends went round Christmas singing, always walking – Hestholme where the Vicars lived then the houses up to Aysgarth, cups of tea and biscuits at a few of them. Then the next night finish Aysgarth and Thornton Rust where Hannah at Low Gill had a lovely spread for us. For me Christmas singing was the highlight of Christmas. It stopped a lot of years ago, maybe because everyone got older, and maybe because we’d not got Dad with his tuning fork. And in the middle up to my Aunty’s for tea. For the boys and girls of Aysgarth who were not always meek. The boys carved names on Chapel pews and led old Jim a dance. But faithful soul that old Jim was, he didn’t stand a chance. Then into a cafe for tea. And thank Him for all the years that we’ve had.